Members of the Chem-E-Car team were jubilant when their car stopped in the last second before the time limit during a regional competition at RIT. Click here to see the video by Dawn Wendt. About 15 students showed up regularly to work on the car this school year, including five other members of last year’s team. “I was really happy with the amount of participation,” Chiang says. The team's other members are Aaron Engel, Abdirahman Shukri, Adrian Marusic, Aime Laurent Twizerimana, Amelia Petrosino, Baris Eser Uğur, Beauclaire Junior Mbanya, CJ Ruff, Ekam Singh Gill, Ellison Etnier, Emily Volk, Joseph Frevele, Londrea Garrett, and William Potter. 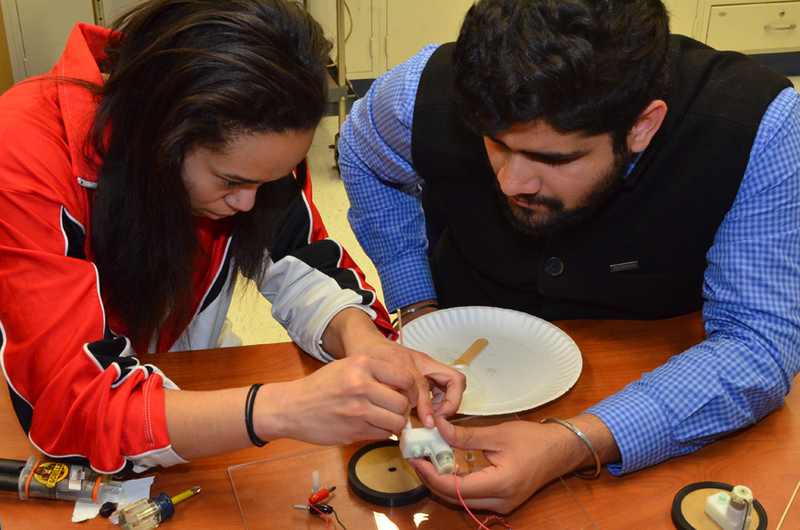 Londrea (Lonnie) Garrett ’20 (left) and Ekam Singh Gill ’19 help assemble wheels for the Chem-E-Car.